Price includes admission fee to Muir Woods. Just outside San Francisco, two wonderful experiences await you. 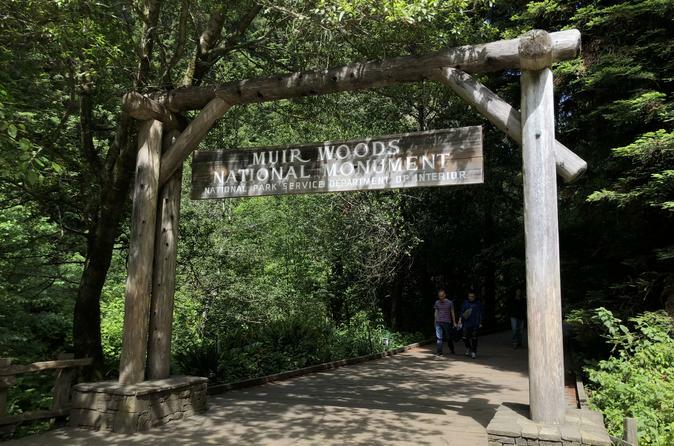 Muir Woods is a virgin stand of Coast Redwoods - among the oldest and tallest trees on earth. Nothing can compare with the sense of grandeur and majesty you will feel as you walk under the canopy of trees thousands of years old. A short distance away, with a stunning view of San Francisco across the Bay is Sausalito - an artists' colony whose waterfront and hillside homes may remind you of a village on the Italian Riviera. Your experienced and friendly guide/driver will pick you up at your hotel in one of our mini vans customized for touring. We'll drive north over the Golden Gate Bridge through the beautiful rolling hills of Marin County. You will be amazed at the picturesque rural vistas so close to San Francisco. Soon we'll arrive in Muir Woods. You will have at least one hour to relax and stroll through the redwoods, along the stream, perhaps seeing the Stellar Blue Jays, Black Tailed Deer or Pacific Salmon. Take a deep breath! The air here is cool, clean and invigorating. Be sure to bring a sweater! Next, it's on to Sausalito! You'll have at least 30 minutes for browsing the delightful shops or grabbing a bite to eat at one of the many restaurants. You may walk along the shore and watch the multitude of sailboats gracefully swooping across the Bay. If you wish to spend more time in Sausalito, you can take the optional ferry back to either Fisherman's Wharf or the Ferry Terminal at the end of Market street. For those who don't stay, your guide will take you back across the Golden Gate Bridge and deliver you to your hotel - ready for more fun in this wonderful City by the Bay!